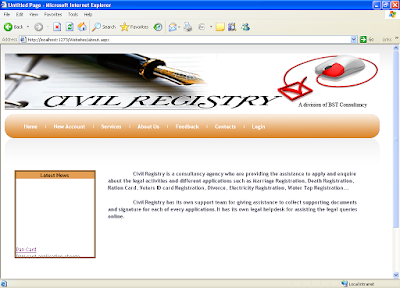 Civil Registry is the online system or agency to help the Indian citizens to apply for their government records like passport, driving license, voter’s ID card, PAN card etc… and register certificates for birth, death, marriage etc. The primary objective of this web site is to give awareness about the government or legal documents and its registration details as well as to help to register or apply for those documents. This also acts as a consultancy agency to assist the public. The main purpose of the web site is to reduce the effort by the candidate and save his time and avoid unwanted rushes at the government offices and assure a smooth working schedule at government offices. The project Civil Registry still requires more development of IT solutions and its applications to improve the issuance of copies of government certificates and legal documents. Civil registry team trying to get more affiliation to government offices and departments. Now civil registry team acting as a agency to help the public.